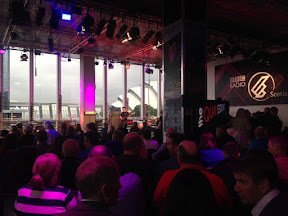 The shortlist for Scotland's big music award was revealed last night at The BBC Quay Sessions during an exclusive live broadcast and the winner will be announced on Wednesday June 29 at a Paisley Town Hall ceremony to tie in with the Paisley bid for UK City of Culture 2021. Previous SAY nominees Fatherson performed alongside last year's award winner Kathryn Joseph before this year’s shortlisted albums were announced live on air by host Vic Galloway. Amongst the shortlist this year are a number international collaborations: Ghanaian and South African performers and producers, LA based glam/art rock icons Sparks (who teamed up with Franz Ferdinand) and a project with 70s disco ensemble Sister Sledge. Producer Graeme Clark also known as The Revenge, and ex Beta Band member Steve Mason all also made it onto the shortlist while FFS were the winner of the public vote. The overall winner will pick up a £20,000 first prize while nine shortlisted titles will receive £1,000 each. Run by the Scottish Music Industry Association (SMIA), previous SAY Award winners are Kathryn Joseph (2015), Young Fathers (2014), RM Hubbert (2013) and Bill Wells & Aidan Moffat (2012).